ATM Market size was estimated at over USD 14 billion and installed base was over 3 million units in 2016. Technological innovations such as the launch of next-generation or smart ATMs is driving the ATM market growth. It allows customers to initiate a transaction via their smart device with mobile functionality near an NFC-enabled ATM system and using biometric enabled security systems or by inputting the PINs. These machines are built with cashless kiosks, and are ideal for non-cash transactions such as appointment check-in and account services. For instance, NCR’s SelfServ 8 features a cash-deposit capability which is suitable for bill payments, and is equipped with touchscreen technology. Moreover, evolution of mass banking from class banking will significantly contribute towards the ATM market growth mainly in rural places due to increasing consumer interest towards self-service channels. Competition among the banks to provide convenient banking for its customers near the doorstep is a factor propelling the ATM market over the coming years. Integration of wireless communication devices such as smartphones, tablets and smart watches with machines has significantly reduced frauds taking place due to the card skimming activities, fueling the ATM market deployments. Moreover, the growth of the industry can be majorly attributed to the rising popularity of solar powered ATMs, which is helping reduce operational costs, and thereby providing an impetus to the ATM market. The evolving regulatory environment may change the competitive landscape across various authorities and may adversely affect the ATM market revenue. If regional governments implement new laws or regulations, or organizations such as Visa and MasterCard issue new rules, that effectively limit the ability of several companies to provide set fees, and foreign currency exchange spreads, thereby adversely affecting the ATM industry, revenue and results of operations. In addition, changes in regulatory interpretations or practices could increase the risk of regulatory enforcement actions, fines and penalties and such changes may be replicated across multiple jurisdictions. Deployment solutions accounted for over 70% of the ATM market share in 2016. Offsite ATMs are anticipated to grow at a significant rate as they offer facilities such as deposits, withdrawals, PIN change, statement of account, balance enquiry, etc. These are mostly subsidized or installed by banks allowing flexible and easy withdrawals to customers. Evolving IT infrastructure and increasing installations of worksite ATMs for to enhance employee satisfaction will further provide growth opportunities over the forecast timeline. The ATM market has been witnessing growth in the managed services segment. Several companies such as NCR Corporation, Diebold Nixdorf, Fujitsu, and Nautilus Hyosung, are focusing on capitalizing the prevailing market opportunities by offering managed services for ATMs which is allowing banks to focus on their core businesses offerings. Outsourcing these services would favor low operational costs, thereby increasing profitability and reducing investments for financial institutions. The ATM market in Asia Pacific will grow at a substantial growth owing to the need to serve massive unbanked population, ever-increasing customer base and rising demand for self-service machine across countries such as China, India, Vietnam, and Indonesia. 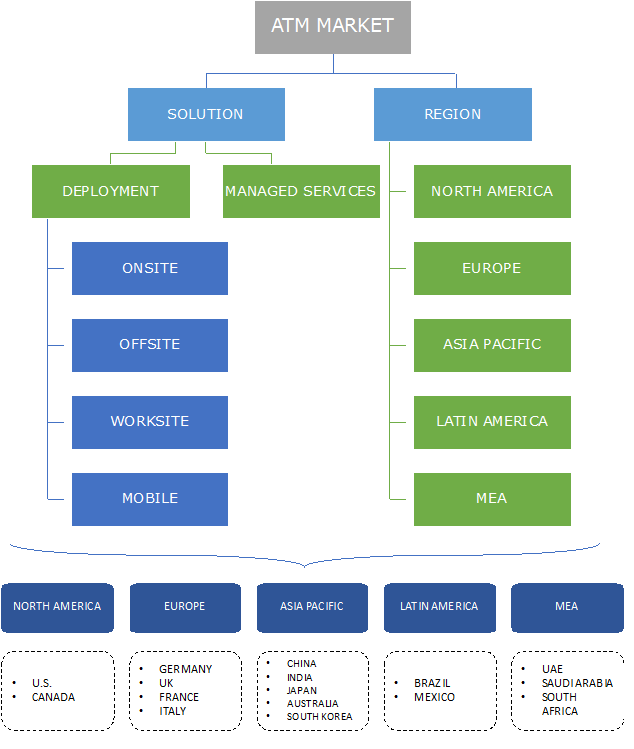 Additionally, increasing trend of outsourcing of ATM managed services by financial institutions is projected to positively impact the market growth across this region. India ATM market is anticipated to be an attractive region in Asia Pacific owing to the need for large scale deployment to bridge the gap between the number of cards issued and the necessary card acceptance infrastructure. Moreover, the digitization initiatives and the support given by the Pradhan Mantri Jan Dhan Yojana (PMJDY), the rural population is encouraged to use debit cards. This has provided a huge opportunity to the manufacturers & providers to develop the base in the country. Vendors offering solutions in the ATM market include Diebold, Euronet, Fujitsu, GRG Banking, HessCash Systems, Hitachi-Omron Terminals Solutions, Nautilus Hyosung, NCR Corporation, Tidel Engineering, and Triton Systems. Companies are providing ATMs to financial organizations, retailers and independent deployers with finance oriented self-service technologies. The systems are being designed to swiftly and efficiently process the consumer transactions and integrate innovative features such as automated cash deposit, web-enablement automated check cashing and deposit, bill payments comprising mobile bill payments. These solutions help enable industries to generate new revenue streams by reducing costs and enhancing customer loyalty. ATMs have become central for access to cash and the banking experience. In some industries, their role has evolved to be complementary to internet, mobile and branch banking. The ATM market has progressed significantly and while the ATMs are still core to the provision to cash access, their role within the retail banking is evolving rapidly. For instance, in the UK, they are offering customers the ability to top-up prepaid mobile phones and make charity donations while in the U.S., the machines are selling stamps. The need and employment of efficient cash cycle management processes has driven ATM market in these countries. The industry has gained considerable maturity in developed countries in the North American and European regions, while the Asia Pacific region is growing at a considerable pace with growing adoption of ATMs in China, India, and several other economies in the region.